If you’re into photography and have ever wondered what gear I use, here’s a full round-up of everything in my camera bag. This is my full-time gig, so I invest in top-of-the-line equipment and I’m not suggesting that you go blow your budget on all of these pieces. 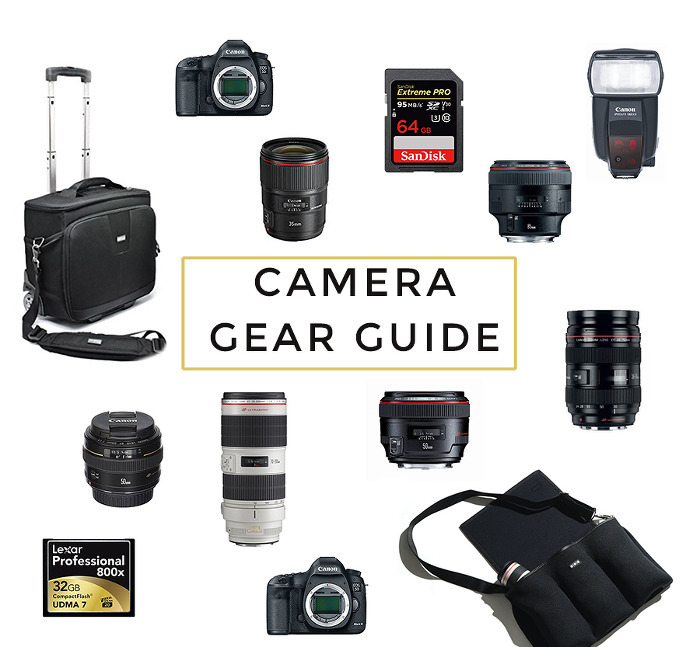 My strategy has been quality over quantity every step of the way, so over the past few years I have built an arsenal of the best gear that the photography industry offers. I still have a few lenses on my wish list that I hope to have by the end of the year! Canon 5D Mark III This is the key piece in my camera bag, the camera that I use all day everyday. There is now a newer version, the Mark IV but the Mark III is still kicking it for me, so I won’t upgrade until I need to. I always choose to invest in lenses over camera bodies. The quality doesn’t change much with each new release, they just add a few new features to entice you to keep buying. Canon 5D Mark II I use the Mark II as my backup camera which means it pretty much just sits in my camera bag. This is the camera I take on family vacations so I can take pictures on the beach without worrying about damaging my primary camera body. It’s an incredible camera, and you can find great deals on it since it’s not the current version. Canon 24-70mm f/2.8 This is my work horse. I use this lens all the time because of it’s versatility. It covers wide-angle through telephoto focal lengths and can do pretty much anything I need. Canon 70-200mm f/2.8 I actually just sold this lens two weeks ago, but I have been faithful to this lens for years. It’s just super heavy and I’m having lots of back problems after carrying it around for five years, so I had to part with it. I already miss it, but my body will thank me decades from now. If you don’t plan to carry it around for hours a day years at a time, this lens is a great investment. I loved it for shooting senior portraits and many use it for sports photography. Canon 50mm f/1.2 I can’t even explain how happy I am to have this lens in my camera bag. It was on my wish list for a long time, but I just couldn’t justify the expense since I had the 24-70 covering that focal length. But oh my goodness it is so worth it! I love the way a prime lens forces you to move your feet and be creative. Canon 50mm f/1.4 This is the first lens I invested in, and it’s great if you’re on a tight budget and don’t have much to spend. I always recommend this lens to our students at Camera School. This is the lens I use on my backup camera for family vacations, again so I’m not worried and sand and water damaging my primary lenses. Canon 85mm f/1.2 This lens is known for it’s dreamy bokeh and creamy skin tones. I’m hoping it will be in my bag soon! Canon 35mm f/1.4 I’m sometimes frustrated as the close range of my 50mm, so I’m confident this wide-angle option would gets tons of use. I’ll likely invest in this one before the 85mm. Lexar Compact Flash Cards I use Lexar and Sandisk brand, but this is currently my primary card. I have about 8 cards. Sandisk Flash Memory Cards One of the best features about the Mark III is it’s dual memory card slots. I record RAW files to both cards, so if by some chance one of my cards got corrupted, I would have the same files on the other card. It’s the best kind of insurance for photographers! Shootsac Lens Bag I’ve used it for about 8 years, and it’s just now starting to show significant wear. I’ll be buying another one soon. Since I shoot with one camera and need to switch out lenses frequently, this bag is key. It makes it quick and easy to swap out lenses. Think Tank Airport Navigator If you’ll ever be traveling with your equipment, this bag is amazing. Of course I would never want to check my equipment on the plane, so this bag ensures that I can carry it on and keep it near me without any trouble. The best part about this bag – well, I guess it’s more like a suitcase – is that it has adjustable compartments so you can customize how to place your equipment. And it has a slot for a laptop and iPad too!